While the kids go after dive sticks, you can post pics of the stunning scenery. Guaranteed to get your crew up in less than ten minutes. Gather around the table for a few quick rounds before calling it a night. Keep up on your cardio even on your "day off" from mountain sports. Resort-to-slopes time? A six-minute drive to the base. Or take the on-call shuttle to the gondola six blocks away. 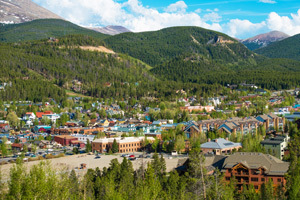 You're located right on lively Main Street, in the heart of downtown Breckenridge. Soak in the scenery from the heated outdoor pool – the largest in Breckenridge! This resort has six outdoor hot tubs – try them all! Spruce Creek Trail is a favorite among hikers, and just a nine-minute drive. Brag about your score after a great game at Breckenridge Golf Club, an 11-minute drive away. Boasting the largest pool in Breckenridge, Main Street Station is literally right on historic Main Street within steps of Peak 9. The onsite ski/snowboard rental shop makes it easy to pick up an extra gaiter or replace the gloves that got dropped off the chairlift the day before (oops). Once you’ve finally got your crew fed and properly layered up (protein bars in pockets), the on-call shuttle takes you from the main lobby to the gondola just six blocks away. Chairs stop running mid-to-late afternoon, giving you plenty of time to hit the huge outdoor pool – it’s the largest in Breckenridge, with breathtaking views of the Ten Mile mountain range. Or recover from your (overly ambitious) mountain exploits with a soak in any of the six outdoor hot tubs. Plan ahead and reserve the 16-seat movie theater for a fun night out (without actually going out). Taking a breather-day? Nab a chair by the fire in the Pioneer Club overlooking Peak 9, or spend an hour at the fitness center followed by a stop-off in the eucalyptus steam room. Spacious, inviting vacation residences come in a variety of configurations, depending on the size of your group. Choose from studios or one- and two-bedroom layouts, all with cozy gas-burning fireplaces and DVD players in the living room, where everyone will collapse after a day on the slopes (and possibly a stop at the pool). If you can rally, head for the granite-counter kitchen and get the tacos started. (If not, there’s no shame in take-out.) Views vary, from spectacular mountain vistas to the endlessly Instagrammable downtown village. The charming, Victorian-style downtown is the largest sanctioned historic district in Colorado, and there’s a private shuttle to get you there – although it’s easily walkable as well. Plan on spending at least a few afternoons/evenings browsing the shops, stopping for hot cocoa or ice cream (depending on the season), and sampling local brews. And if you’re new to Breckenridge or haven’t skied it for a while, you’ll be happy to hear the recently added Peak 6 expansion added over 540 acres of terrain – which translates to a whopping 23% increase in skiable area. - Guests should proceed directly to Main Street Station, located at 505 South Main Street, Breckenridge, Colorado, 80424, for check-in assistance. For further details, please contact the hotel directly using the information found on the reservation confirmation received after booking.